Introduction: Acquired benign esophageal tracheobronchial fistulae are clinically rare. 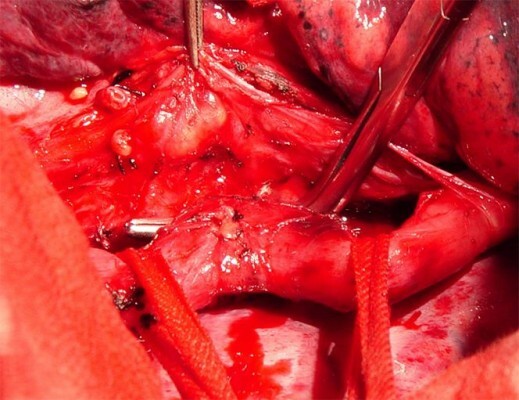 In this paper, we summarize our experiences in surgical treatment of 14 consecutive patients with acquired benign esophageal tracheobronchial fistula. Methods: This series included patients who underwent surgery between January 2002 and June 2015 at our institution. We retrieved and analyzed data on demographics, operative characteristics, and surgical outcome of the patients. Results: Bronchofiberscopy revealed the membranous trachea openings of fistulae and gastroendoscopy further showed lesions in the anterolateral wall of the esophagus. Thoracotomy, division of the fistulous tract, and closure of the esophagus and trachea and other procedures were performed. All operations were uneventful, and there was no perioperative and postoperative complication or death. Symptoms disappeared after surgery in patients. The median length of hospital stay was 53 (range 31–270) days. The patients were followed up for a median of 33.5 (range 15–168) months. No recurrence was reported. Conclusion: Our results suggest that acquired benign esophageal tracheobronchial fistulae have a broad spectrum of anatomic pathologies and exhibit markedly varied clinical manifestations, and a surgical approach tailored to the condition of individual patients is recommended.